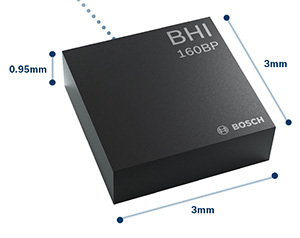 Bosch Sensortec has released the BHI160BP, a position tracking smart sensor that uses integrated inertial sensors to improve GPS location tracking. Bosch will exhibit the new sensor at Electronica Munich, Nov. 13-16. When used with a GPS or GNSS module, the BHI160BP enables users to take full advantage of pedestrian position tracking with up to 80 percent saving in system power consumption compared with a typical GNSS-only solution, without compromising on accuracy, the company said. Users benefit from greatly extended battery life and longer charging intervals for wearable applications such as smartwatches and fitness trackers as well as mobile devices such as smartphones. The new position tracking approach is set to enable a new class of compact devices with even smaller batteries, Bosch claimed. The BHI160BP tracks a person’s position by intelligently applying an inertial-sensor-based algorithm for pedestrian dead reckoning. 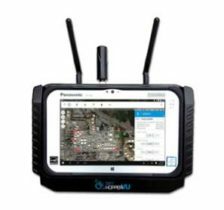 To maintain accuracy, it calculates the user’s relative location based on data collected from the inertial sensors and then recalibrates itself every few minutes to obtain the absolute position provided by the GNSS/GPS module. This means that the GNSS/GPS module can be kept in sleep mode for most of the time, which drastically reduces a device’s power consumption and extends its operating time. With the BHI160BP, a device can maintain solid accuracy even when the GNSS signal is blocked or weak, such as near tall buildings or indoors, the company added. 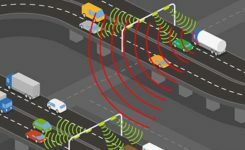 This ensures accurate pedestrian navigation at all times, even in shielded indoor areas such as subways, Bosch said. The BHI160BP is a new member of Bosch Sensortec’s BHI160 family and adds application-specific functionality for position tracking. 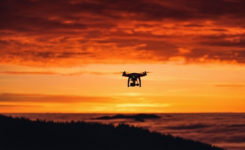 It provides a ready-to-use solution that can be quickly and easily integrated into a system design without requiring an update to a new GNSS module, thereby significantly cutting time to market, Bosch said. While the current configuration is optimized for use with GNSS receivers (such as GPS), the BHI160BP can also support most of the common global localization technologies. According to the company, the BHI160BP can handle gesture recognition and 3D orientation, with 3D calculations performed by the sensor itself rather than by an application processor. The new BHI160BP draws 1.3 mA in active operation mode and integrates the company’s Fuser Core microcontroller and a six-axis inertial measurement unit. The BHI160BP offers a variety of customized virtual sensors, such as a calibrated accelerometer, orientation and wake-up gesture, within a single device. It BHI160BP can be extended by connecting additional physical sensors, such as a magnetometer, over a secondary interface. The new BHI160BP comes in a compact 3 x 3 x 0.95 mm³ LGA-package and is pin-to-pin compatible with the BHI160. It will be available via distribution in December.